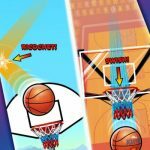 Dunk Hoop may seem like a curious name for a basketball-themed game, but once you learn how to play it, everything makes sense. 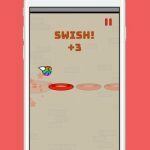 This iOS-exclusive title from the master of casual games, Ketchapp, will have you dunking balls through a hoop, but not in the way you would normally think. This time around, you will be controlling the hoop. In this sense, it is more of a catching game than anything else. Just move the basket in order to catch the falling ball. The more balls you catch, the higher your score will be. There are several customizations waiting to be unlocked. You can change up the look of the net, the hoop, and even the ball. Just keep playing in order to unlock them all! 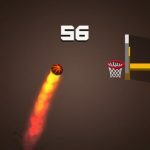 If you need help in getting your scores up, make sure you read our Dunk Hoop tips and tricks for some important pointers! While catching balls sounds easier than shooting them, you will quickly discover that the game is a lot more challenging than it seems. You will need to learn how to make perfect shots if you want high scores. Standard shots are only worth one point each. Perfect shots will start you off with two points for the first shot. The points will keep going up for every consecutive perfect show you make in a row. Keep making perfect shots in order to score some major points! The game has a prize wheel where you can win various in-game customizations. It works a lot like slot machines in the sense that you need to have three matching icons in order to win something. You get a free spin every six hours. If you don’t feel like waiting that long, you can also watch a video advertisement in exchange for a free spin. Make sure you have internet connection in order to take advantage of the ad offer. Spin as often as you can to increase your chances of winning new customizations. The balls will go faster as you progress in Dunk Hoop, making it more difficult to catch them. The problem is, the speed goes up based on the time elapsed, not the number of points you have. That means the game will continue to get more difficult regardless of your score. Try to make as many points as you can in the beginning of the game. This way, you won’t have as much trouble getting more scores even if the game speeds up. The game will register your taps regardless of where you place it on the screen. That is why you should not hesitate to find the most comfortable position for your fingers as you play the game. You can even use your finger as a visual guide. Place it over, or under, the basket in order to get visual guide on when you need to tap. Even though the shots will get faster the longer you play, you should not be reckless in catching the balls. You will be able to continue playing for as long as you don’t miss. Take advantage of the slow ball speed at the start of the game to make a lot of perfect shots. This is a great way to rake in a lot of points early on in the game. Just take your time and focus on making perfect shots. 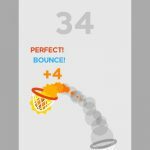 Catching balls with the hoop is a lot of work, but with the help of our Dunk Hoop tips, hints and tricks, you will be making top scores in no time!